After opening sets by manzai duo Knights and the Suzuki-Suzuki brother-sister musical impersonator team, Hosono Haruomi took to the stage at sold-out Nakano Sun Plaza. The 70-year-old revealed a surprising new look: his head is now topped with an unruly shock of white hair. Backed by a talented young band that included the wonderful and seemingly omnipresent Takada Ren on a range of stringed instruments、Iga Wataru on bass, and the duo Good Luck Heiwa on keyboards and drums, Haruomi played a characteristically low-key but quite satisfying set. I’d seen him perform live before with YMO and also with Yano Akiko, but this was my first solo Hosono concert. Much of the material featured his recent bent toward cover versions of standard numbers, played in Western Swing style: “Ain’t Nobody Here But Us Chickens,” “Tutti Frutti” “L’Amour,” “Angel on My Shoulder,” “Suzi Q.” This is the style found on his solid new CD, Vu Ja De, as well as on its predecessor, HoSoNoVa (2011). Several times during the night, Hosono spoke of his love for boogie-woogie tunes–a predilection that especially came forward during the final part of the evening, when stride pianist Saito Keito took over on keyboards. 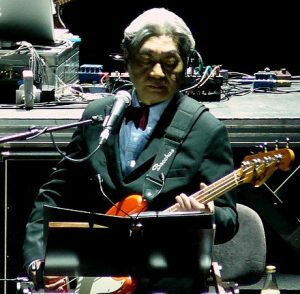 Hosono has never liked being the front man: he feels more comfortable playing bass at the back of the stage than standing at the mike down front. He joked when his set began that he wished everyone in the audience would stop looking at him, and he seemed delighted when he left the stage for a couple of numbers midway through to give the backing band its turn in the spotlight. Then, when it came time to bring the main set to a close, he introduced the last number by saying, And this next song, thank god, is the last one. But he carries the unwelcome burden of fronting the band well: his easygoing humor and self-deprecation have their own unmistakable charisma. And his inimitable baritone voice (well, actually, imitable, as the Suzukis showed in their opening set) remains fully intact.